Camp roads provide access to your summer retreat or home but can also be a major source of sediment and other pollutants to your local lake or stream. The nutrients attached to camp road sediment can be bad news for lakes. Phosphorus from road sediment can cause algal blooms and cause other negative impacts to water quality. More on the Impact of Camp Road Erosion on Lakes. Proper road maintenance protects local water quality and ensures the road will be free of potholes, ruts, and other problems that make a road dangerous and difficult to travel on. To do this, the road needs to be designed and maintained to shed water from its surface into nearby wooded areas. 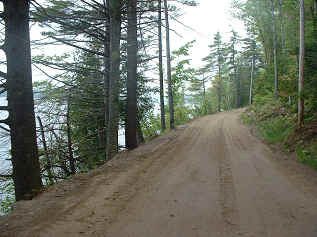 Environmentally Sensitive Road Maintenance Practices for Dirt and Gravel Roads (offsite) - US Forest Service and PA Center for Dirt and Gravel Road Studies field guide to identifying visual signs of problems associated with causes and solutions for the most commonly encountered road problems. Having a road association can provide a way for you and other road users to formally manage the road in an organized and cost-effective manner. An effective camp road maintenance program is a major step towards helping protect your local body of water. To learn about the benefits of, the types of, and how to form road associations, go the Road Associations website. The following are general descriptions and should not be used in any legal manner. Go to the actual statute for details or contact your regional DEP "on-call" person during business hours. Private Way Law (Title 23, Chapter 305, Subchapter 2) – this statute provides the authority for and guidelines under which a statutory road association can form. Erosion and Sedimentation Control Law (Title 38, Chapter 3, §420-C) – requires that a person who conducts an activity involving filling, displacing, or exposing earthen materials take measures to prevent unreasonable erosion of soil or sediment beyond the project site or into a protected natural resource such as lakes, rivers, streams, coastal waters, and wetlands. Contractor Certification in Shoreland Zone (Title 38, Chapter 3, §439-B) – this statute goes into effect January 1, 2013 and requires excavation contractors conducting excavation activity in the shoreland area be certified in erosion control practices by the DEP. Natural Resources Protection Act (NRPA) (Title 38, Chapter 3, §480-B) - this law regulates activities in, on, over or adjacent to natural resources such as lakes, wetlands, streams/rivers, fragile mountain areas, and sand dune systems. For lakes, it regulates certain activities 75 feet from the lake. The program uses permit by rule (PBR) for certain classes of activity. Shoreland Zoning (Title 38, Chapter 3, §435-449) - this law is primarily administered through municipalities, and involves the regulation of activities in the shoreland zone (250 feet from lakes and 75 feet from streams).